The following story is on display at Hotaru Museum in Chiran Town, Kagoshima Prefecture. Tome in the story refers to Tome Torihama, who ran Tomiya Restaurant in Chiran during WWII. Reiko is her daughter. 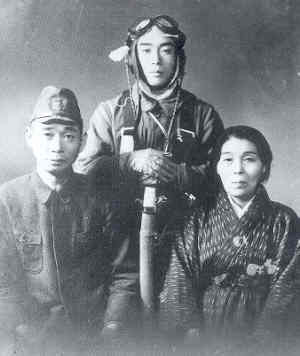 Sergeant Shimohira spent time with Tome and her two daughters like his own family until his sortie. Tome always used to tell the story, "I wanted to be Sergeant Shimohira's mother." Reiko was told by Tome, "Go together with them to Ariyoshi Photography Studio." Shimohira and his parents had their last family photo taken there. On the next day, as he took off, he waved his hand to his parents who had come to see him off.